This summer Mike made a huge career change, leaving the office world behind for the fresh air at Soergel Orchards, a local, family-owned farm market. Soergel’s is a fun place for both kids and grown-ups; if you live in the Pittsburgh area and have never been, you must go—not just for the experience, but for the produce. Soergel’s has helped me realize why locally-grown produce is the best choice, both gastronomically and economically. Because local fruit and vegetables spend no time in transit, they don’t have to be preserved and waxed like their commercial counterparts. Taste-wise, there is no comparison—you haven’t tasted an apple, or a strawberry, or a butternut squash until you’ve had one from a local field. Economically, buying local keeps money in your community and supports families who work incredibly hard, doing what they love, in order to bring fresh, nutritious, high-quality food to your table. 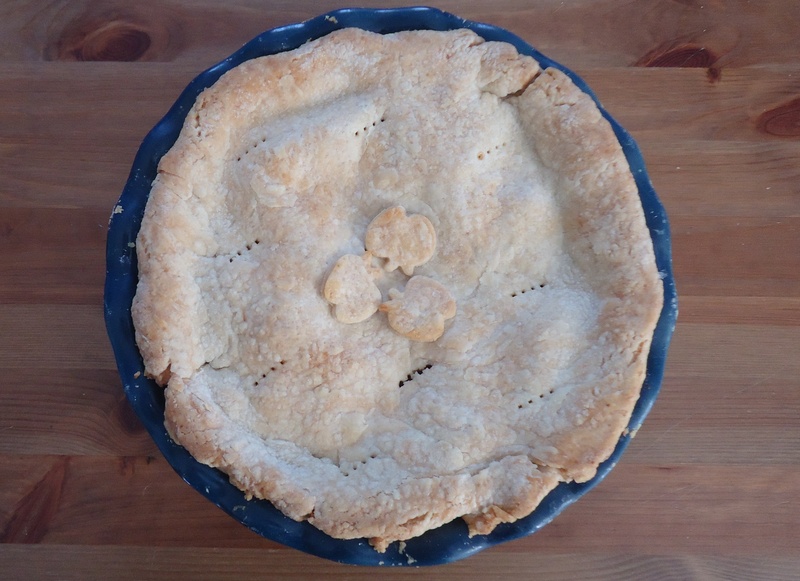 The apples in this pie are Jonagold and Mutsu from Soergel’s orchards. Using two different kinds of apples, one tart and one sweet, adds an interesting dimension of flavor. Line a 9-inch pie dish with crust and place on a rimmed baking sheet to catch any overflow. In a large bowl, combine sugar, flour, cinnamon, and nutmeg. Add apple slices and toss to coat. Pour into prepared pie dish; cover with top crust and trim edges. Gently prick the top crust with a fork to allow steam to escape. Bake for 25 minutes, then uncover the edge and bake another 25-30 minutes, until crust is evenly browned.